1. Introduction to Environmental Geomorphology. Definition of geomorphology. Geomorphology and geology. Geomorphology as a science. Environmental geomorphology. Environmental impact. Geomorphological risk. 2. Geomorphological Resources. Geomorphological raw materials. General aspects. Earth materials. Soil. The contribution of geomorphology in the search for other natural resources. Landforms. A method for surveying, mapping and assessing landforms as geomorphological assets. 3. Geomorphological Hazards. Geomorphological instability. Soil erosion. Introduction. Physical bases of erosion. Water erosion. Aeolian erosion. Models for evaluating water erosion. Landslide hazard. Introduction. Types and causes of landslides. Methods for landslide investigation. Landslide hazard assessment. River hazard. River erosion. River instability. Marine hazard. Geomorphology. The Hazard. Glacial and periglacial hazard. Introduction. Ice-rock avalanches. Supraglacial debris/rock fall/slide outside the lateral moraine. Ice fall from snout of glaciers (ice avalanches). Rapid advance of glacier snouts (surges of glaciers). Emptying of internal water-pockets, proglacial lakes and ice- damned lakes. Highwater events on the valley floor connected with the presence of glaciers. Lahars. Hazards derived from mountain climbing. Mass falls owing to glaciopressure. Assessment of the hazard derived from the presence of ice masses. Avalanches. Rock glaciers. Debris flows. Final remarks. Geomorphology and seismic risk. Seismic risk. Morpho-neotectonics. Geomorphology and seismic susceptibility. Earthquake-triggered mass movements. Geomorphology and volcanic hazard. Geomorphological hazard maps. Causes of hazard. Effects of hazard. Synthesis of survey. 4. Man as Geomorphological Agent. An approach to the problem. Man's activities and their geomorphological consequences. General aspects. Consequences of hunting. Consequences of animal-farming. Consequences of agriculture. Consequences of resource exploitation. Consequences of engineering works. Conclusions. 5. Vulnerability and Geomorphological Risk. Vulnerability to hazard. Risk mitigation. Prediction and forecast. Environmental education. 6. Geomorphology and Environmental Impact Assessment. Introduction. Concepts. Methodology. Types of projects. Investigation phases. Mapping. Indicators. Evaluation of hazards and assets. Evaluation of impacts. GIS techniques. Quantification of impact. Raw materials. Landforms. Processes. 7. Conclusions. References. Geomorphology has now reached a certain level where the methodology, scientific content and results being published in the field make it worthy of being considered as a major environmental research area. 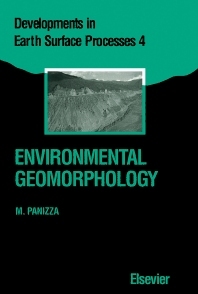 In preparing Environmental Geomorphology, the author has given priority to methodology and illustrative case-histories. Schemes and classifications that would be ill-suited for a naturalistic, empirical and non-systematic discipline like geomorphology have been avoided. The concepts outlined in the text are based on a subdivision of geomorphological resources and hazards (as well as their links with man) together with the consequent risk and impact problems. Each investigation, study or intervention concerning the environment, cannot ignore either the human context in which it occurs or man's history and prospects. It is necessary to have the right dialogue and relationship with the other disciplines making up this system so as to apply the most suitable methodologies and offer the most valid solutions. For some subjects covered in the book, specialists concerned with a particular section of environmental geomorphology were consulted. The text of each chapter is accompanied by several illustrative schemes, figures and photographs, derived from real research and professional experiences. The volume is addressed both to university students studying topics of geomorphology as part of their syllabus, and to researchers and consultants (geologists, geographers, engineers, naturalists, etc.) working in the field.